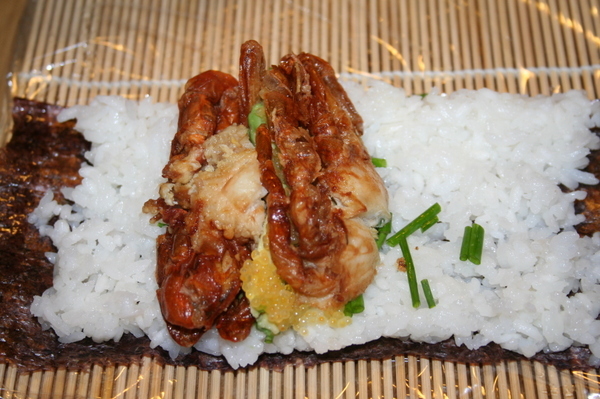 Another favorite of mine is any sort of maki roll made with soft shell crab. You can get them at just about any sushi bar, I think. I can get them at a couple of local grocery stores that have mini sushi stations near the seafood counter. Or, we can make them at home. Which, if you saw this post a few days ago, you already know. I just figured I'd discuss the preparations in a bit more detail today. My husband is usually the sushi maker in our house. We both can do it, but for whatever reason, he has taken it on as his job. I'm the fry cook. So anyway, we wanted to do an all-Japanese meal over the weekend, and Bill was looking through the gorgeous Nobu: The Cookbook, by Nobuyuki Matsuhisa. What a beautiful book. 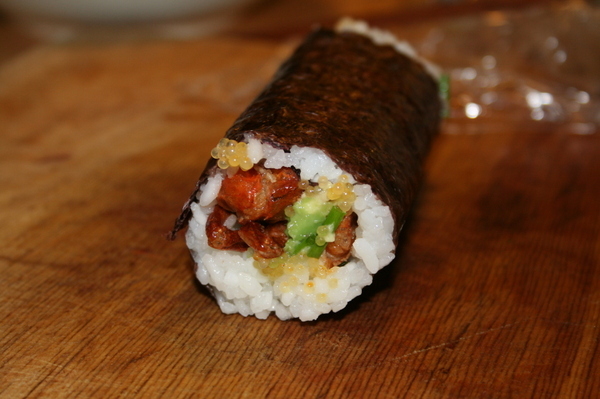 And it's well written, and well illustrated, with plenty of step-by-step photos to show how to, for example, assemble a maki roll. The autobiographical section of the book is quite detailed as well. He's had quite a life thus far. But anyway - on to the crab roll. 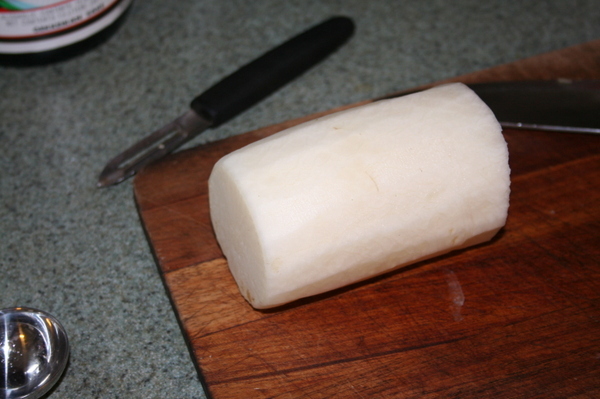 1 straight and uniform daikon radish, with ends trimmed, peeled. 1. Spreading the rice. 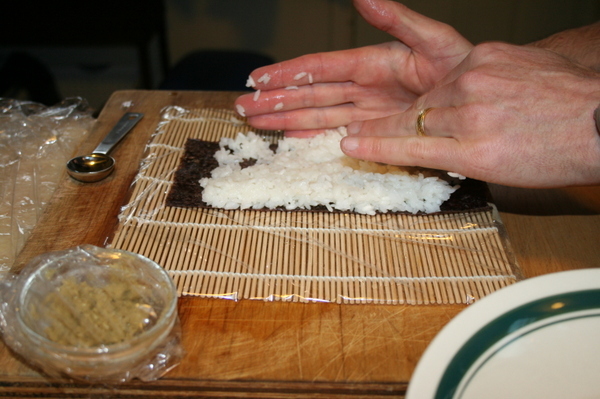 Spread the vinegared rice on the sheet of nori. 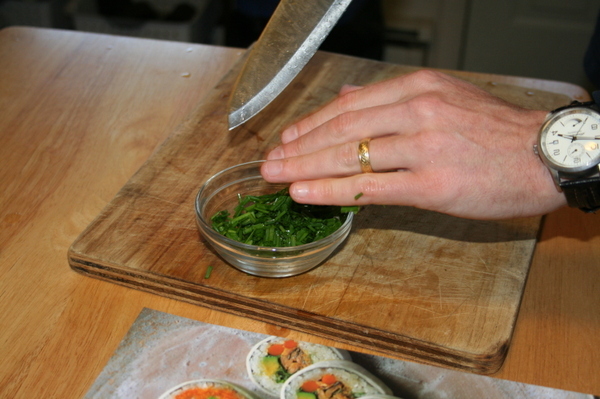 Using your left hand to make sure the rice doesn't spill over the left side of the nori sheet, spread the rice out evenly toward the left by pressing - but not squashing - the rice with the fingertips of your right hand. Repeat, using opposite hands, for the other side. 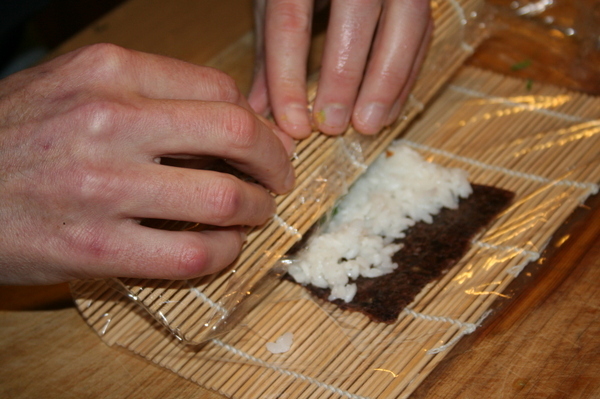 You should make the rice a little thicker at each end of the nori in order to form a "bank." Leave about 3/8 inch of the nori sheet free of rice at the side furthest from you. 2. Adding the wasabi and filling. When the rice is thoroughly and evenly spread over the nori, apply an unbroken streak of wasabi across the middle with one finger. 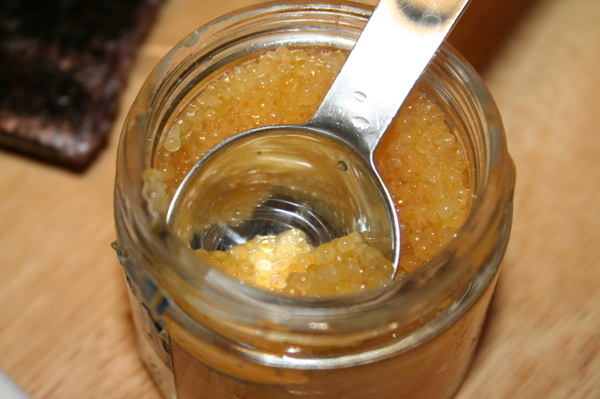 Then, using a spoon, spread the chives and the fish roe evenly over the wasabi and across the rice. Add the avocado on top. 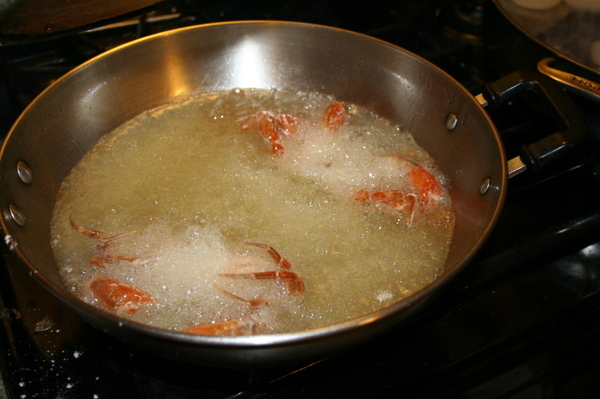 and deep fry for 3 to 4 minutes. 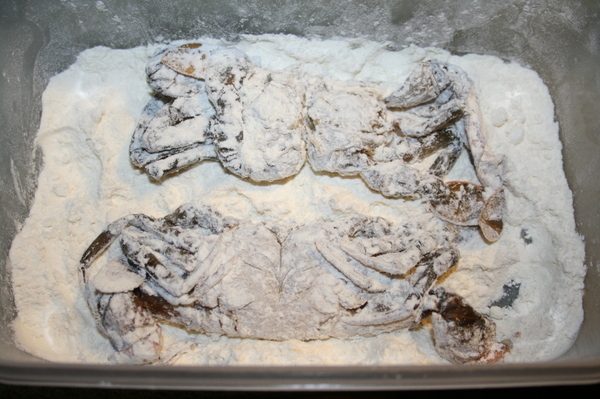 Cut the crab in half and add it to the roll while the crab is still hot. 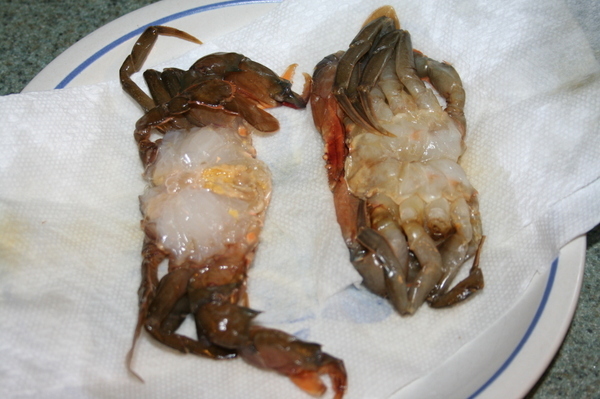 Because the crab is the bulky part of the filling it should be firmly compressed before rolling. This will make rolling easier. 4. Rolling with nori. 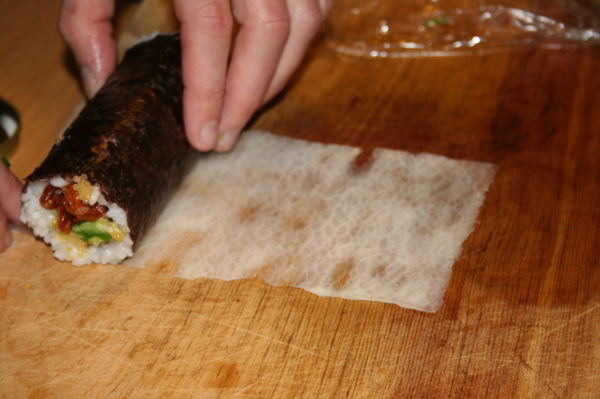 Lift the end of the nori nearest you and carefully roll it over the filling, pressing down as you go. 5. Making the daikon peel. 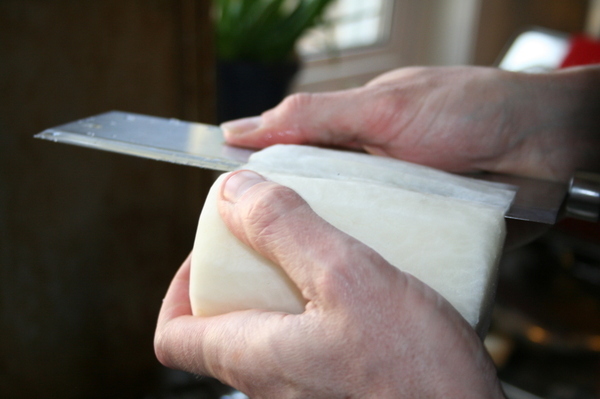 Holding an 8-inch knife firmly, move the daikon against the knife, turning the daikon gradually to cut the flesh into a paper-thin ribbon. This is called katsura-muki. You should end up with a strip 4 inches by 12 inches. 6. 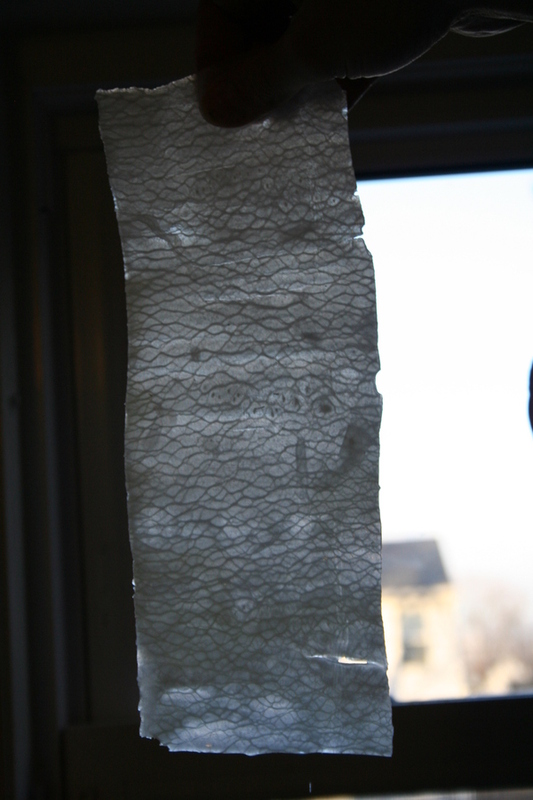 Rolling with the daikon peel. 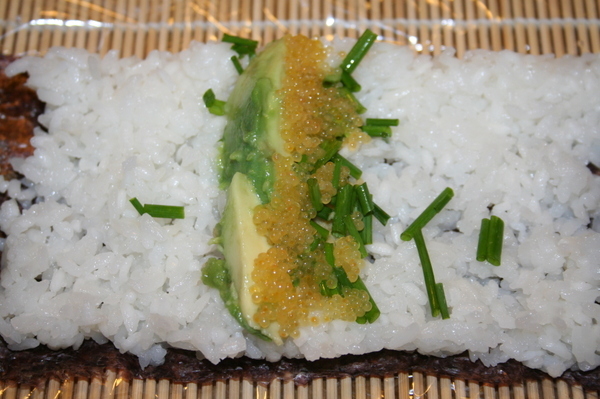 Place the nori on top of the strip of daikon and roll away from you. 7. Cutting. Press down on the roll again at both ends to settle the filling, and trim the ends with a knife to tidy the shape. Starting from the middle, cut the roll into 6 pieces of equal size. Like I said, Bill made two crab rolls, and truthfully, I could have eaten both of them by myself (hidden in a corner of the kitchen so no one would see me until it was too late). 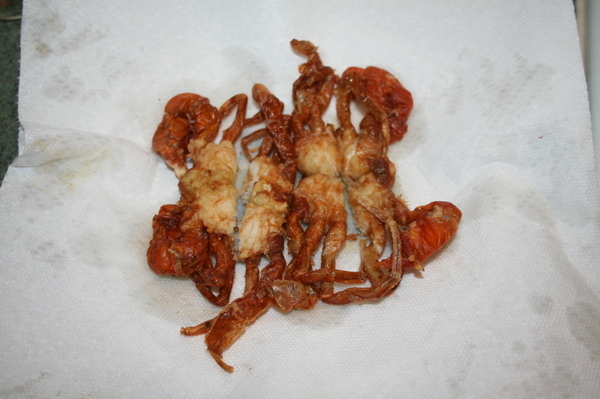 The daikon gave them an extra level of crunch, along with the crispy portions of crab. In contrast, you have the creamy texture of the avocado, the pop of the fish roe, and tangy thin bite of the chives. 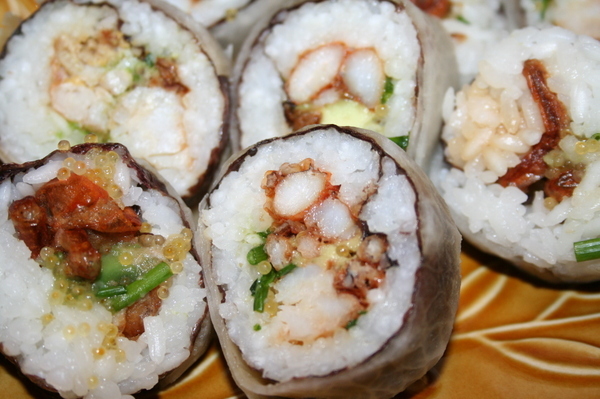 All of this wrapped in perfectly cooked morsels of rice and the sea-salty sheet of nori. Actually, I could probably eat three of these rolls, if I was really hungry.